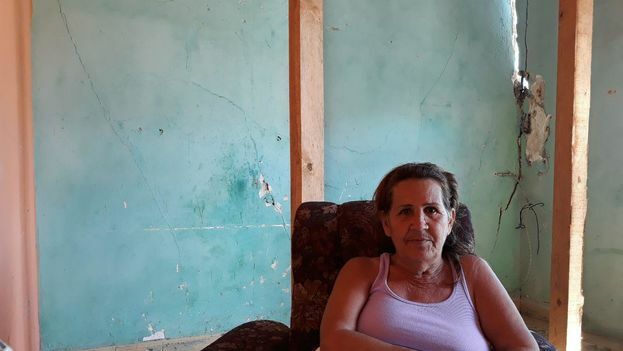 14ymedio, Luz Escobar, Havana, 5 February 2019 — María Elena López has spent more than a week with her “nerves on edge.” Entrenched in the back part of her home in Luyanó, Havana, she saw on January 27 how the walls were cracked and the rain came through the roof in torrents when the tornado hit. Five days later, an architect determined that her house should be demolished because of the damages it suffered that fateful night. 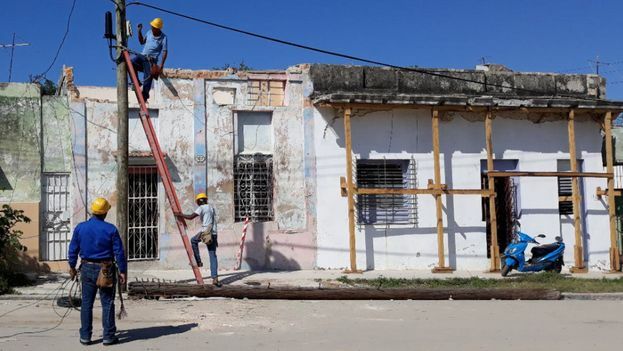 López lives at 169 Quiroga Street and last Friday told 14ymedio about the causes for a sadness that started long before the blowing of those 300 km/h winds that twisted the lives of thousands of Havanans that last Sunday of January. López spent years asking for a home, between paperwork and postponements. Finally she managed to get a state-owned place that she could put in her name, commission the plans for a complete renovation, and request a subsidy to begin the work. However, the gusts of the storm destroyed her plans. 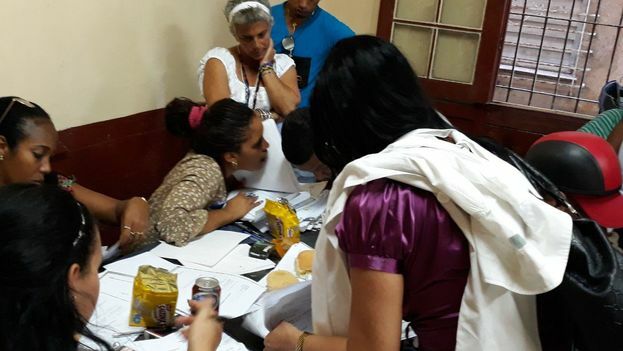 The help for the reconstruction that she requested took so long that this willful Havanan planted herself in front of the office of the Institute of Housing of her municipality. She didn’t move until she obtained the wood and the workers to brace the facade of the deteriorated place. “They finished the work on Wednesday and the tornado came on Sunday,” she remembers. That coincidence saved her life. “If I hadn’t made demands as I did, the house would have come down that night with all of us inside,” she reckons. According to official data, in the Cuban capital some 3,780 houses were damaged by the weather event and 372 of them totally collapsed. López’s house was fragile long before the fury of the tornado struck the island’s most populous city. Now, the fight is to preserve the space. The majority of the owners affected prefer not to move from the place. Vandalism and the fear of “losing out because they aren’t there” mean that they remain among the ruins, as they wait for authorities to evaluate the damage. It is a task of patience and of nerves, where whoever gets tired will have the worst lot. So, taking refuge in the shade cast by the only wall that remains standing in a house, underneath some tree on the sidewalk, or protected in the entryway of a neighbor, the tornado’s victims wait for a government inspection to put into numbers the damage they suffered and facilitate the purchase of construction materials at preferential prices. Although electrical service is practically recovered in the most affected areas, the inventory of the destruction has barely begun. Especially that which details the damages suffered in domestic infrastructure, very difficult to calculate because they include not only the architectural impacts but also the lost of appliances, household items, and personal belongings. 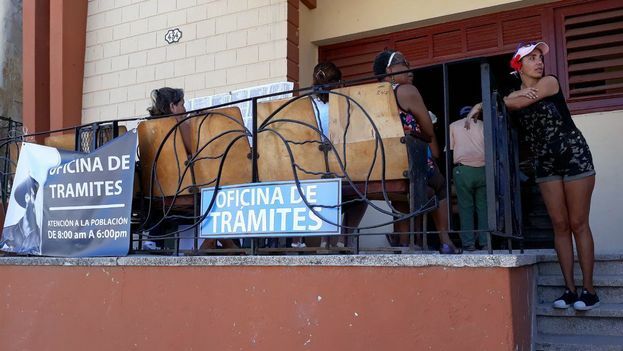 “They can help me to buy cement, but who’s going to help me buy a refrigerator, the mattress I lost, and the clothing that ended up I don’t know where,” lamented a mother of two children this Monday in Luyanó. “All this cost me years of work and I’ve lost it in a few minutes,” she reflected. The government has noted that it will implement a discount for purchasing construction materials equivalent to 50% of the price, but official conduct on other occasions awakens mistrust. The traditional shortage of steel, sand, and bricks leads the tornado’s victims to fear that the solution could be delayed for months or decades. “Friday night a soldier came here, he put his hand on my shoulder and he said, don’t worry, we’re going to do your house, but I don’t even know what his name was,” she laments. “After it’s demolished, where will I go?” López asks in a small voice. She fears that she will have to start from scratch on that bureaucratic path that she knows so well. “I have to repair the whole house but they tell me that the paperwork for the subsidy they once awarded me but they never gave me are overdue,” she says. In a pocket of her bathrobe, the only garment she saved from the tornado, the woman carries a fork and a spoon, the little she is left with from what was once her kitchen, her house, and her home.